Have you ever made a great mailart envelope and then felt a little bummed when you notice that the picture and the colours on the stamp do not match the theme and sort of ruin the perfect ensemble? I have and I'm quite sure you have too. This time, let's do it the other way around! Get some postage stamps with pictures that inspire you. Then build your mailart around them. For example, I have stamps with garden berries, so I could easily make a garden or berry themed mailart envelope. 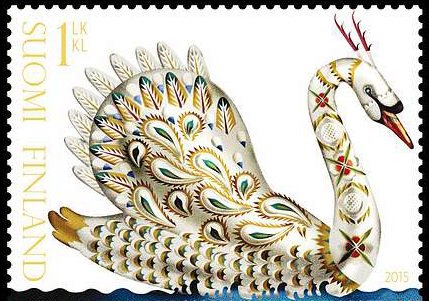 I also have stamps with a swan, so I could make a bird themed one. Or if I go crazy with the 30 cent stamps with birch leaves, I could make a tree themed one! So, take or make any size of an ENVELOPE, a beautiful postage stamp and decorate the envelope TO MATCH THE STAMP YOU ARE SENDING IT WITH. You can either decorate one or both sides. It does not need to be super artistic, this swap is open to all levels of skill and experience. Sender's choice, of course. Inside the envelope send a SMALL FLAT PROFILE BASED SURPRISE to your partner (a couple of postcards, stickers, a bookmark, packet of gum, a few teabags...) along with a note with the name of the swap and your username, etc. At least in my country the amount of postage follows weight limits. 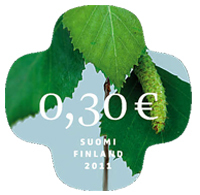 Anything up to 20 grams goes with the basic first class stamp which costs â‚¬1.20. With a stamp like this I could send any of those things I listed. The point is to pick something flat and lightweight to send, the main point of this swap is to send a decorated envelope. So, it's important to know the weight limits or any other limits and rules concerning postage, and to have a scale or other tools to measure your envelope. In Finland you can download a PDF file with the weight limits and costs from the post office website or use an online calculator. See if your country's postal services provide useful tools.